C-COM: Flyaway mobile antenna for Eutelsat Ka-sat satellite. 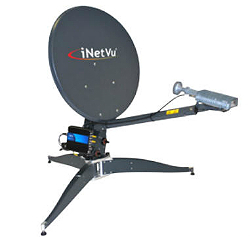 Canada, June 2014: C-COM Satellite Systems Inc., the leading global provider of mobile auto-deploying satellite antenna systems, has announced that it has received type approval for its iNetVu® FLY-75V Ka-band antenna system from Eutelsat for use on its KA-SAT Tooway service. Eutelsat is one of the world’s leading satellite operators delivering service into 150 countries via 37 satellites. The iNetVu® FLY-75V mobile antenna system is now officially approved to operate on Eutelsat’s KA-SAT, a High Throughput Satellite that offers its new-generation NewsSpotter service. The product is among the few fully auto-pointing Ka-band Flyaway antenna systems to receive such type approval. “We are very pleased with this type approval as this is the first of a series of iNetVu® FLYAWAY antennas which will be undergoing the approval process with Eutelsat” said Bilal Awada, CTO of C-COM Satellite Systems Inc. “The Fly-75V system has passed all mechanical, optical, and RF performance tests with high level of pointing accuracy and repeatability, as required by the Autopointing Verification Test per Eutelsat ESOG-1 Module 260 requirements” Mr. Awada continued. “This highly portable, lightweight system, which can be assembled by one person without any tools in less than 10 minutes, is aimed for broadcasters and first responders who require high speed broadband connectivity coupled with a quick field setup” said Leslie Klein, President and CEO of C-COM Satellite Systems Inc.